FileD: Independent external library written from somebody else with MIT licence. The code is in an external directory independent from my code, as part of the python installation and will not be changed by myself. Must I include the Copyright statement of FileD in my own MIT licence text of FileC or somewhere else in the environment of FileC? Or should I only give a note with the reference to the external MIT licenced library (FileD) within the readme of FileC and the Copyright statement of FileD remain only in the source code or licence text of FileD? Similar to (1.) Must I include the Copyright statements of FileD and FileC (just my own) in the GPL licence text of File B? Must I include in the GPL licence text of FileB or anywhere else in the environment of FileB the information that there are existing dependencies to one or more MIT licenced libraries? Or did the dependencies to the MIT libraries get lost within the GPL licence and can only be reconstructed by following the library definitions? To license each part of your work under a specific license (GPLv3 for some components and MIT for others), one way is to place a header in each file or directory that states the license under which that part is distributed, and then refer to the full license text. For the MIT license, you can just use the entire full license text in your file because it is so short. For external libraries, the easiest way is to include the package unchanged in a separate directory, retaining any notices already there. Include a GPLv3 header  in each .py file and the full license text in a file such as LICENSE.GPL. If you decide to display Appropriate Legal Notices in your application, then anyone who uses your work as a derivative will be bound to also include such notices as interactive screens in their version. If you decide not to display notices interactively, then derivatives need not do so. See section 5(d) of the GPL Version 3. Include all the original files of the external library. If you made no changes, you have no further obligations. Must I include the Copyright statement of FileD [the external library] in my own MIT licence text of FileC [my core algorithm] or somewhere else in the environment of FileC? This would only be required if you copy and paste the external library code (FileD) into your own program files (FileC). If you include them as separate files or directories, it will be easier to maintain and easier to tell what is what. If they are separate, then referring to FileD (the external library) from FileC (your core algorithm) would just be a technical matter of using the programming language's facilities for using external code (e.g. the 'import' keyword in Python, the '#include' directive in C, and so on). This file is a part of KateWare. the file LICENSE.GPL included in the packaging of this file. In the MIT header, I would avoid including the phrase "this file is a part of KateWare" in the header, because it may cause confusion of what Bob should write in the notice if Bob wants to include your MIT licensed parts in his BobWare application, without redistributing KateWare as a whole. For more information see Do copyright dates need to be updated? and Which year to put in copyright notice when mixing old content? Not the answer you're looking for? 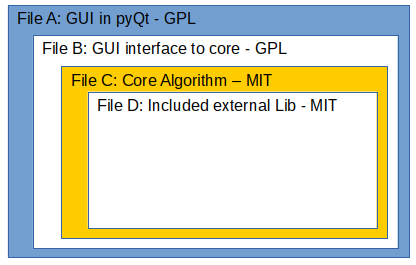 Browse other questions tagged mit gpl-3 copyright dependencies python or ask your own question. Can I take MIT licensed code and distribute it under BSD?